The CUNY Sentences Mixed with Cafeteria Noise at +8dB is a recording of CUNY Sentences recorded to the same channel as Cafeteria Noise to present sentences in noise. These sentences can be used in auditory training or for other circumstances when a large amount of sentences are required. They are not designed specifically for word recognition, and there are no data available. CUNY Sentences Mixed with Cafeteria Noise at +8dB includes: a) the audio recording, and b) sentence list. This product does not include administration instructions or normative data. It is assumed that purchasers of Auditec’s products are well trained in their use, purpose, and interpretation. Available from Auditec, Inc. Call 1-800-669-9065 (from US) or 314-416-1050 (outside the US) to order. FREE shipping within the contiguous US. INTERNATIONAL CUSTOMERS: Online ordering does not include shipping and handling charges. Please email auditecinfo@auditec.com with your test selections along with your state or country for an exact quote. If you use online ordering, you will be invoiced later for the shipping charges. Researchers recommend hearing professionals use both verbal and nonverbal testing to evaluate patients. Nonverbal testing is especially useful when testing patients: 1) who do not use English as a first language, 2) who have language limitations due to hearing impairment, or 3) who use cochlear implants. Auditec offers a variety of nonverbal tests to suit the unique needs of hearing professionals around the world. The Sound Effects Recognition Test (SERT) is a picture pointing test that uses sounds like a barking dog, whistling, or a vacuum. It includes instructions and normative data for ages 3-6 as well as the audio CD and the corresponding picture book. Hearing professionals who are testing adults may find Environmental Sounds (also known as Forty Familiar Sounds) a beneficial test to add to their battery. This recording includes sounds like: bowling, roller coaster, and a babbling brook. A similar recording called Filtered Environmental Sounds includes those sounds at specified frequencies. These recordings can be employed as the hearing professional sees fit. No normative data or instructions are included; however, a sounds list is included. Nonverbal tests play a key role in auditory processing. Auditec offers the Random Gap Detection Test, Gaps In Noise, Pitch Pattern Sequence, Duration Pattern Sequence, and Masking Level Difference-Tone Version to audiologists all over the world. Instructions and score forms (in English) are included with the audio CD purchase. Minimizing the language barrier in auditory testing opens up a whole new world for hearing professionals to understand the limitations of hearing and processing of their patients. Nonverbal tests can be valuable tools to help hearing professionals identify hearing problems and diagnose disorders. Whether testing children or adults for either auditory discrimination or auditory processing, Auditec offers nonverbal tests for professionals with even difficult-to-test patients. Attention Deficits: Is it ADD/ADHD or APD? Children with attention deficits can be hard to diagnose. Is it attention deficit disorder (ADD)/ Attention Deficit Hyper Activity Disorder (ADHD) or is it an Auditory Processing Disorder (APD)? Auditec offers tools to help professionals correctly diagnose children so that appropriate steps can be taken to manage the attention deficit. Many professionals still rely on solely on subjective information such as observations by parents and teachers to diagnose ADD/ADHD. However, there is an objective, quantifiable test to help diagnose (or rule out) ADD/ADHD as a cause of the child’s attention deficit. It is called the Auditory Continuous Performance Test (ACPT). This test is a recorded word list given in quiet (no background noise). The child listens and responds to a target word. It is a pass or fail test with normative data on ages 6-11. Auditec provides established and reliable tests like the Auditory Continuous Performance Test. With these tools, skilled professionals can confidently diagnose children with the correct disorder(s). Then recommendations can be customized according to the diagnosis to help the patient succeed in life. “Problem kids” become superheroes, and their skilled professionals do too! Auditec customers often tell us they need tools to test cochlear implant users. We sell three recordings specifically designed for cochlear implant users as well as many other tests that could be used with cochlear implant patients. The three tools are 1) Lexical Neighborhood Test/Multi-syllabic Lexical Neighborhood Test (LNT/MLNT), 2) BKB-SIN, and 3) Minimal Auditory Capabilities (MAC). All three of these include recordings and instructions so that customers can test cochlear implant patients with confidence. Since children with cochlear implants generally perform poorly on the PBK word list, it is not a recommended recording for cochlear implant patients. Instead, we recommend the Lexical Neighborhood Test/ Multi-syllabic Lexical Neighborhood Test (LNT/MLNT). It was specifically created to assess open-set speech performance in cochlear implant children. Since cochlear implant users report speech recognition is more difficult in noise, audiologists need a tool to test cochlear implant patients with noise. The BKB-SIN (Speech In Noise) uses sentences in four-talker noise at varying signal-to-noise ratios. This test has also been used to determine cochlear implant candidacy. If traditional speech materials are too difficult to evaluate hearing ability in an adult cochlear implant patient, we recommend the Minimal Auditory Capabilities (MAC) Battery. It includes gross sound identification, inflection detection, contrast detection, accent discrimination, and word identification with subtests such as question/statement, vowel recognition, spondee recognition, noise/voice, accent, SPIN High-context sentence, familiar sound recognition, monosyllabic word discrimination, and more. The LNT/MLNT, BKB-SIN, and MAC Battery are three different tools audiologist can use for cochlear implant patients. However, there are other recording selections in Auditec’s catalog that may be suitable depending for your your needs such as noise recordings, environmental sounds, or auditory training. Auditec gladly provides professionals with the tools they need to help their unique set of patients succeed in life. Auditec will be closed Thursday, November 26, 2015 through Friday, November 27, 2015 in celebration of the United States Thanksgiving holiday. This is a special time of year when Americans get together with friends and family to express gratitude for all we have in life. Here at Auditec, we would like to express our gratitude to our customers (old and new) with a coupon. Customers who mention the word THANKFUL will receive 20% off of their entire purchase if it is placed between November 18, 2015 and November 25, 2015. The discount does not apply to shipping, handling, taxes, or duty. It is valid on retail prices as listed. No other sales or discounts can be combined. 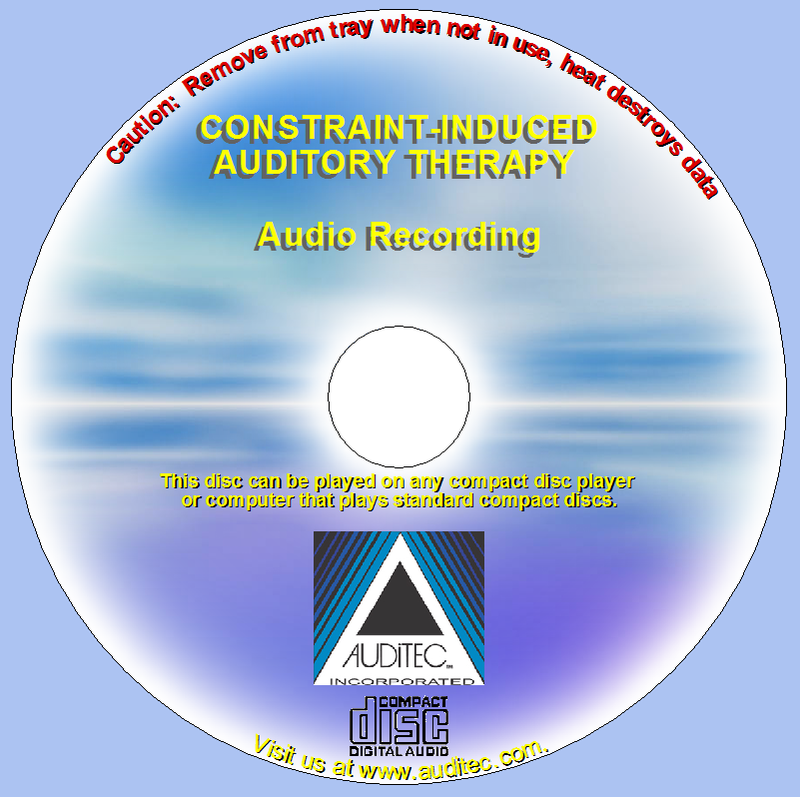 This is the perfect time to order the Constraint-Induced Auditory Therapy Standard version [Item CD124-9; Retail Price $1395.00 USD + S&H] because that will save you over $200.00! If you are using the old WIPI First Edition Picture Book (blue or green cover), this is a great time to update to the WIPI Second Edition Picture Book (maroon cover) [WIPI 2nd Edition picture book only with nor recording is Item P132R; Retail Price $79.75 USD + S&H] because you will save over $15.00! There are lots more products to save on in our catalog! Check out Auditec’s price list for a full list of our products. This is a limited time offer so do not wait. Expand, update, and upgrade your auditory library today. Thanks for being an Auditec customer! We wish you a Happy Thanksgiving! It is recommended that audiologists use established, reliable tests with both verbal and non-verbal stimuli that assess different auditory processes. Auditory Processing Disorder Tests are often broken down into four categories. The categories are 1) DICHOTIC LISTENING for binaural integration and separation, 2) TEMPORAL PROCESSING for auditory pattern temporal ordering-APTO and temporal resolution), 3) MONAURAL LOW-REDUNDANCY (monaural separation closure-MSC), and 4) BINAURAL INTERACTION. Auditec sells tests for each of these categories. Auditec allows audiologists to design their own custom auditory processing disorder battery with any of the above tests. You can determine which tests will be used to examine based on your patient’s needs and age range. Once you have compiled a list of your test selections, email it along with your state/country to auditecinfo@auditec.com for an exact quote with ordering instructions. 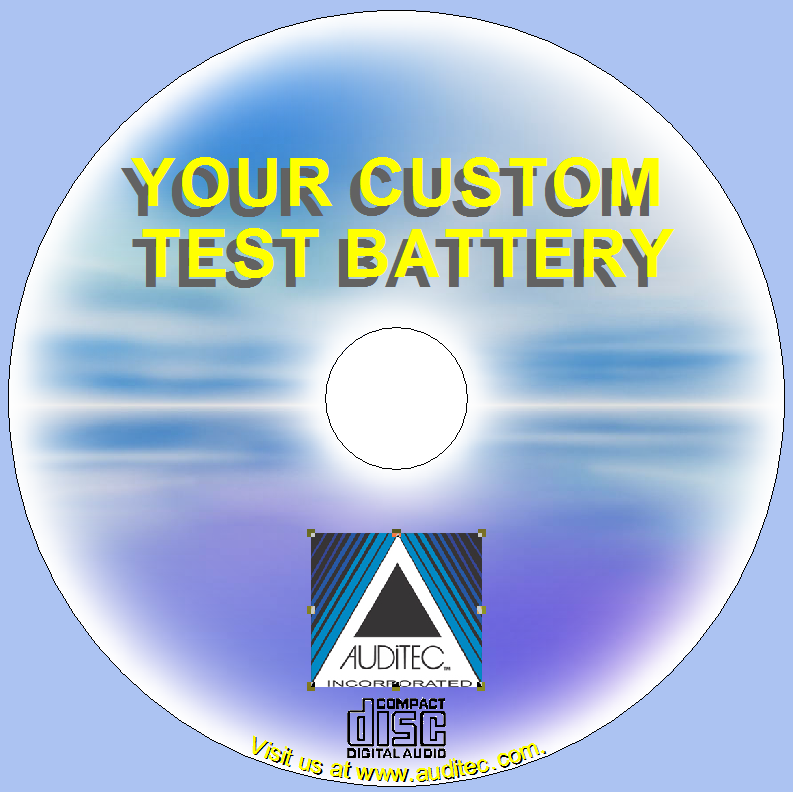 You can receive several popular tests at a discounted price by selecting the APD Battery. The APD Battery (CD170-9) includes Gaps In Noise (GIN), Random Gap Detection Test-Standard (RGDT), Pitch (Frequency) Pattern Sequence – Musiek Version, Duration Pattern Sequence – Musiek Version, and Masking Level Difference-Tones. The power to help your patients is within reach. If your patient has a specific ear deficit on dichotic listening tasks, consider the Constraint-Induced Auditory Training Program (CIAT). It is appropriate therapy for children with dyslexia, persons with hypersensitivity to noise, adults with aphasia, or anyone who would like to improve their listening ability. The most common question we get about this training program is: what would this therapy look like inside my organization? One of the greatest advantages to CIAT therapy is the enormous selection of materials. Twelve compact discs of recorded material is included in the standard version. Another benefit of the CIAT is the included manual on CD-Rom. It provides a wealth of information like an overview, background, case studies, exercises and worksheets. The only equipment you need is a CD player and stereo headphones. You might begin by asking your patient (or patient’s parents) to commit to two 30-minute sessions for six weeks. You can be flexible and slow down the program or accelerate the program to suit the patient’s needs. Therapy begins with over two CDs with exercises like dichotic digits, dichotic consonant-vowels, dichotic letters, and dichotic sentences. The patient will listen and respond as the therapist scores. After the exercises are complete, the patient moves onto short stories in noise and then a much longer story in noise. The stories are a listening task with no set exercise or scoring, but the therapist may ask occasional questions about what is happening in the story to make sure the listener is engaged. Auditec now includes a complimentary backup of the longer story (discs 5-12) with every purchase of the CIAT – Standard and Longer Story versions. This backup allows professionals to loan this portion of the CIAT to their patients for self-administration at home. Auditec has received positive feedback about the use of this program. Their patients are experiencing improvement thanks to their caring audiologists. Will your patients be next? Email auditec.kb@gmail.com with your state/country to receive an exact quote with ordering instructions for the Constraint-Induced Auditory Therapy (CIAT) Standard.